Add a camel and two sheep to complete your Real Life Nativity. This three piece set includes a kneeling camel and two sheep. The sheep are modeled after the breed of sheep found in Bethlehem. Awassi sheep are notable for their shaggy coat, dark face, ruggedness and tolerance to extreme conditions. 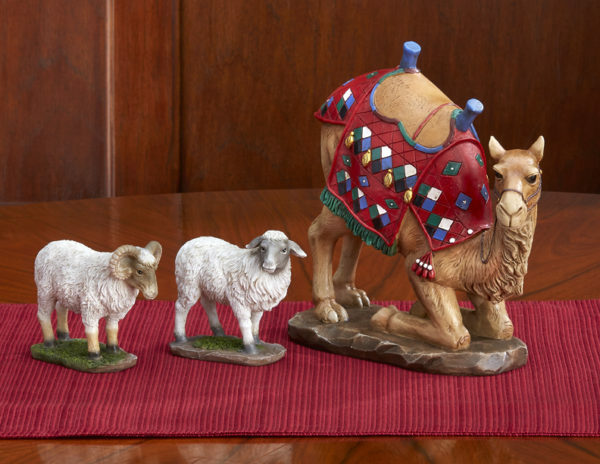 The set includes one ewe (female) and one ram (male) along with a brightly dressed camel kneeling in a reverent pose.